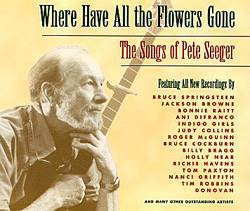 This tribute to Pete Seeger includes a studio recording from Bruce. Bruce was joined by a ten-piece band to record "We Shall Overcome," including violin, banjo, accordion, and horns (featuring Ed Manion and LaBamba), as well as Patti Scialfa and Soozie Tyrell on backing vocals. It's a beautiful rendition. The double CD includes 38 other tracks as well, with artists like Billy Bragg, Nanci Griffith, Indigo Girls, Bruce Cockburn, Jackson Brown & Bonnie Raitt, Roger McGuinn, and even Pete Seeger closing the set with one of his own.